As we have headed into 2018, latest trends and innovative ideas have surfaced bringing new challenges before the website designers. The advanced technologies of virtual reality, voice user interface and artificial intelligence are being immersed in the field of web designing taking it to a whole new level. This year we will see a further development in the existing trends of web animations, bespoke illustrations, brutalism and conversational interfaces. Website designers need to stay ahead of the curve to keep a hold of the changing pace of website designing. 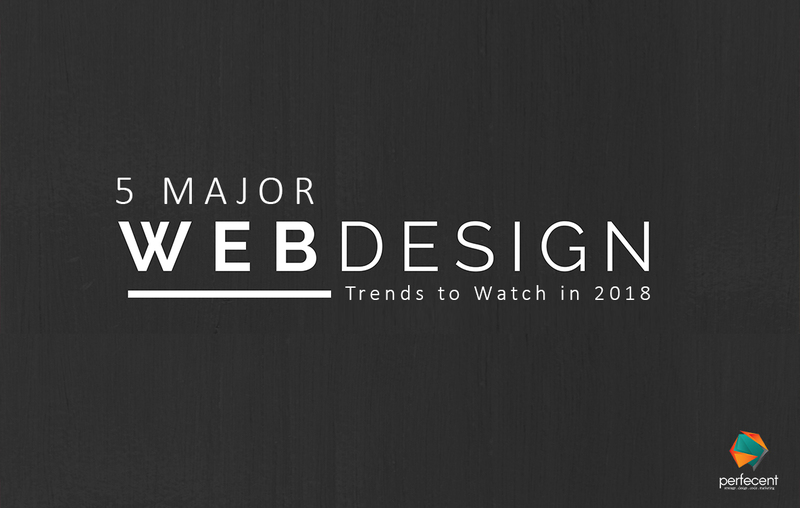 Here’s a list of 5 interesting web design trends that can help you improve the online presence of the website in 2018. Asymmetrical and broken grids became popular in 2017 and are expected to be witnessed more frequently this year with a slight alteration in split screen designs. Prepare your web designing tools to create different split visual elements on an asymmetrical pattern. Although this technique is mainly irregular it requires a perfect balance between the two sides of the layout without overshadowing either side. Trends appear and then disappear but the use of vibrant and contrasting colors has been there forever. The only element of the website that catches the attention of the user at first glance is the color. Therefore, the designer should choose the best palette of hues that can stand out and complement the design style of the website. With the rising use of web animations, colors and fonts will take the place of images to make the website visually appealing. Website designers are mainly focusing on the growth of animation to use it in unique ways in order to enhance the user experience and increase conversions. Scrolled animations especially parallax scrolling has widely become popular in web designing. Animation, if properly used, can make a website more interacting, engaging and entertaining. There’s no need to go too extra with the animation as subtle and minimal animation can also create user engagement, keeping the look of the website sophisticated and elegant. When it comes to designing a website layout, the use of white space becomes a common matter of conflict between the designer and client. Clients like more stacked webpages loaded with excessive information whereas, the designers are fond of using white space. Well, the trend goes with the designer’s choice as white space will continue to be widely used in 2018 with more creativity and uniqueness. You can create an impact with your website design by using bold fonts surrounded by empty space of intense colors. One of the best techniques and highly advanced website designs of 2017 were driven by artificial intelligence (AI) including chatbots and voice user interfaces. With Google’s AlphaGo and Apple’s Siri, it doesn’t come as a surprise that AI has invaded the digital realm. Several tech companies are now making the latest AI tools available to the web developers changing the whole concept of web designing. With the commencement of the new year, reshape your designing skills and reinvent your own ideas using the above-mentioned techniques. Needless to mention that besides all the trend and techniques it is your creativity that matters the most at the end.